Dhaka, 9 May, Abnews: A milad and doa mahfil was arranged for late Dr MA Wazed Miah, an eminent nuclear scientist and husband of Prime Minister Sheikh Hasina, at Ganabhaban, the official residence of the premier, here today. 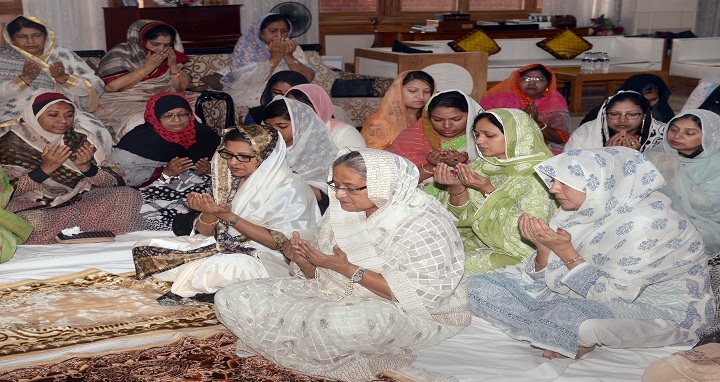 Prime Minister Sheikh Hasina and her younger sister Sheikh Rehana attended the milad and doa mahfil held after Asr prayers on the occasion of the 9th death anniversary of Wazed Miah. Besides, ministers, PM's advisers, parliament members, central leaders of Bangladesh Awami League and its associate bodies, family members and relatives of Wazed Miah and the officials of the Prime Minister's Office (PMO) joined the milad and doa mahfil. A special munajat was offered seeking eternal peace of the departed soul of Wazed Miah. Munajat was also offered seeking eternal peace of the departed souls of Father of the Nation Bangabandhu Sheikh Mujibur Rahman and other martyrs of the August 15 carnage as well as continued peace, progress and prosperity of the nation.